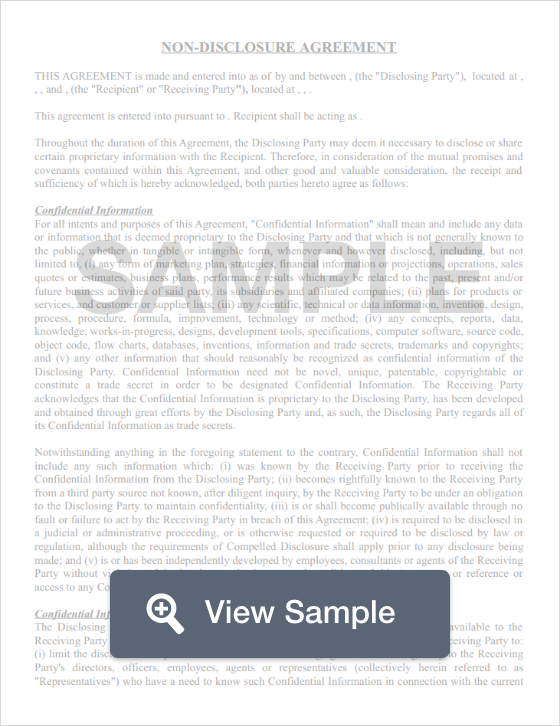 What is a Connecticut Non-Disclosure Agreement? Connecticut Non-Disclosure Agreement: What Is It? A Connecticut non-disclosure agreement must be specifically worded in order to be enforceable in the event that a legal dispute takes place. A Connecticut non-disclosure agreement must clearly define what information, trade secrets, prototypes, etc., are covered. Connecticut non-disclosure agreements are governed by the Uniform Trade Secrets Act, Conn. Gen. Stat. 625 § 35. The purpose of an NDA is to protect business or trade secrets. Under the Uniform Trade Secrets Act in Connecticut, a “trade secret” is defined as information of some kind (such as a formula, pattern, compilation, program, device, method, technique, process, drawing, or customer list that has its own potential or actual value. This information may not be easily found out by the public or by others in the industry. The business that considers the information a trade secret must take reasonable efforts to make sure that information remains secret. Connecticut non-disclosure agreements cannot be overly broad in nature. They are most effective when used with a reasonable Connecticut non-compete agreement.